I love the amusing picture I have of the rebellious hydrangeas (not to mention the jaunty ‘top-hatted’ gentlemen behind them). I have another hydrangea that has destroyed half its pot but is still managing to sit there, looking very full of itself, with just the back and bottom of the pot. It looks as if it’s the queen of the garden sitting on its throne! It is no easy task, writing three lines and putting a smile on the face of the reader. No easy task at all, but you do it time and time again. I’m a big fan! I’m usually smiling when I write them, too 🙂 A “big fan” … that’s nice. Thank you, Bill, my good friend. I’m with Bill – smiles aplenty across the pond! They’re just by my kitchen door, so they’re the first things I see (along with my petunias) whenever I go outside. Bright pink is my favourite colour, so they always make me smile and put me in a good mood. Seriously. I’m not a fan of petunias but hydrangeas… big time. I’ll have to go and sniff my petunias now, but I’m not aware of them whiffing 😉 Are you sure you’re not muddling them up with geraniums that are pretty to look at but rather stinky? Silly woman! I still enjoy them; i just don’t have to plant them in my garden! Would it? How pleased I am to read that!! Ha ha. You have fair made me smile with this. Will you be leaving the blue pot as a hat? He has worn that pot-hat for the last four years. It started out black but has turned blue with age! my smile of the day!! That must be why they’re one of my mom’s faves 😉 Have a terrific weekend, Sarah! Hi your haiku sounded like you are a true gardener. In Minneapolis we have white and a gray blue…but pink I haven’t seen yet. 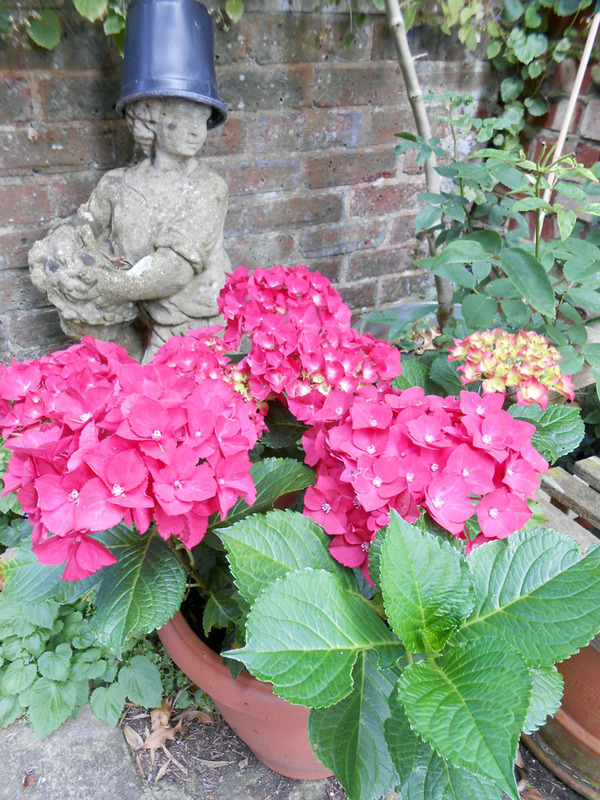 My garden has chalk soil so most of my hydrangeas are pink. The ones in this picture were always this deep pink; however, one that started out blue now has a mix of bluish pink and candy pink flowers. I don’t think I would have any bluish pink ones, but for the fact that I put rusty nails in the pot. I also have a variety that is called white lace, but it’s very moody and not as healthy as the others.